The HR platform consists of FREEDOM HR-UV, HR-VIS, and HR-VIS-NIR for high resolution down to 0.2 nm in the UV, 0.4 nm in the VIS and 0.6 nm in the VIS-NIR. The size of the spectrometers is only 61 x 64 x 19 mm. 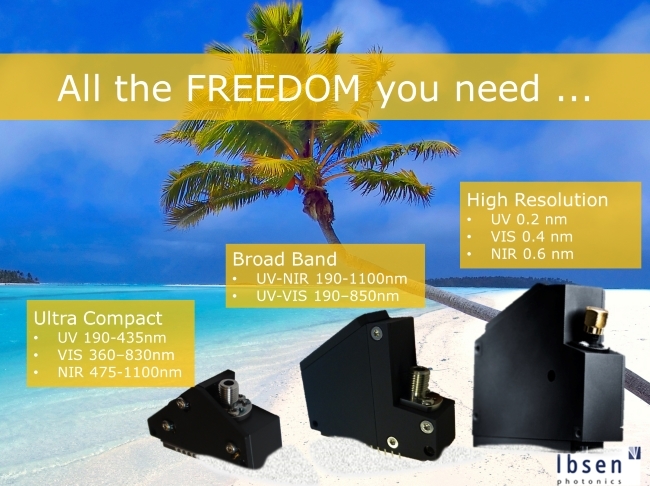 The FREEDOM HR series offers the perfect balance between compact size and high performance in your instrument design due to the use of Ibsen Photonics unique transmission grating technology. The spectrometers are robust and almost athermal and can operate under demanding environmental conditions. The FREEDOM spectrometer platforms are intended for integrators of compact instruments, where performance cannot be sacrificed for small size. Examples of applications enabled by the FREEDOM spectrometers are handheld Raman analysers and Laser Induced Breakdown Spectroscopy (LIBS) instruments. “Ibsen Photonics has managed to obtain a unique combination of high performance and small size by using our high groove density master transmission gratings made from pure fused silica in all our FREEDOM spectrometers”, explains Thomas Rasmussen, VP of Sales and Marketing and adds, “Our FREEDOM spectrometers enable stable production at our customer’s manufacturing site and a good end-user experience through a low unit-to-unit variation and robust and thermally stable operation. These are factors that are often overlooked but nevertheless crucial for success in the market for handheld instruments”. On top of the instrument design freedom provided by the high performance and small size, all FREEDOM spectrometers can be configured with a range of CCD, CMOS, and NMOS detectors as well as an optional USB controller and accompanying software. This enables the customer to develop – or re-use – his own electronics and to choose the detector that best matches his requirements in terms of sensitivity, signal-to-noise ratio, linearity, and cost.